Are you looking for all-season color – flowers in bloom from spring to fall? Many annuals flower all summer, but most perennials bloom for a short time only, usually a week or two, or a month to six weeks for longer-blooming plants. The trick for color through the season is to group plants so that as one clump fades, perennials nearby are coming into flower. Many gardeners have trouble achieving all-season color because they do most of their plant shopping in spring – buying plants that are in bloom at the time or that are about to come into bloom. We all know that plants already in bloom sell faster, right? The trouble is if you shop the nurseries like this – buying only in bloom – by mid-July or early August, your garden is finished. No fall flowers, no all-season color – even though there are a couple of months of warm weather to come. 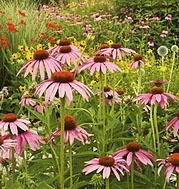 Combine perennials that bloom at the same time into groupings. For example, try early-flowering Siberian irises and peonies, planting them in a group of one peony next to at least three irises. Beside this group, add plants that will bloom later, such as daylilies and purple coneflowers (Echinacea purpurea) in front of summer phlox (Phlox paniculata). Between clumps of perennials, plant groups of bulbs, such as tulips, daffodils or ornamental onions (Allium species) for spring color, as well as clumps of long-blooming annuals, such as blue salvia or cosmos, and you’ll be on your way to continuous bloom. Don’t forget foliage. For a garden that looks good when plants have finished flowering, choose perennials with attractive leaves. Green is a color too and leaves also come in other lovely shades, such as burgundy, silver and lime green. Some perennials in the ‘neat leaves’ category are yarrow, astilbe, peony, Siberian iris and pinks (Dianthus species) and ornamental grasses. Read more information about designing with foliage and good foliage plants. What about shade? Admittedly, color through the season is easier to achieve in a sunny garden. Most shade-tolerant perennials bloom early in the season, so a shade garden will not be as colorful as a sunny flower garden. Annuals such as impatiens and begonias can help and hostas bloom in mid-summer, but your shade garden is going to be more dependent on attractive foliage. More shade gardening tips.